Welcome back to our organizational series, where on the last day of each month, we’ll roll out a new closet-related topic with expert-approved tips and advice. With us this month is Melanie Charlton from Clos-ette, who will be sharing her organizational insight. When you're dealing with cramped closet space, there's one rule I always repeat: Use all the spaces you thought couldn't store anything. You would be surprised at how much space is looked over in even the smallest of closets. Whether it's behind doors or even on the ceiling, when you're dealing with limited space, utilize every bit of space available to you. All you need are the right tools. Keep reading for three underutilized areas to store items in your closet. That's right—you can even use your closet ceiling to store wardrobe items. Most people don't realize that this space can be utilized almost in the same way as dead wall space. Use the closet ceiling for seasonal storage, hanging bags, or installing hat or coat hooks. This is also a great space for shoe and boot storage. Shallow wall space is another overlooked area you can put to use in your closet. I love using a peg wall to hang scarves, bags, jewelry, or even sunglasses. Scarf hardware and shallow shelves are perfect for storing clutches and accessories. Have any angular spaces in your closet that aren't quite long enough to hang clothing? Try filling in vertical space instead by implementing a shoe rack. Line up shoes heel to toe in pairs so you see more shoes in the front row. 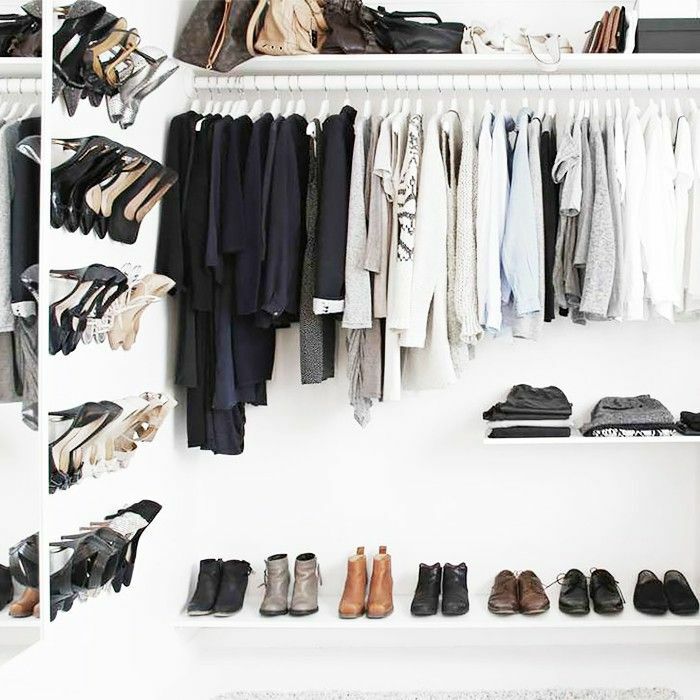 What rule do you always follow when organizing your closet?